In 2017, hundreds of thousands of people called for animal sentience to continue to be recognised in British law post-Brexit. 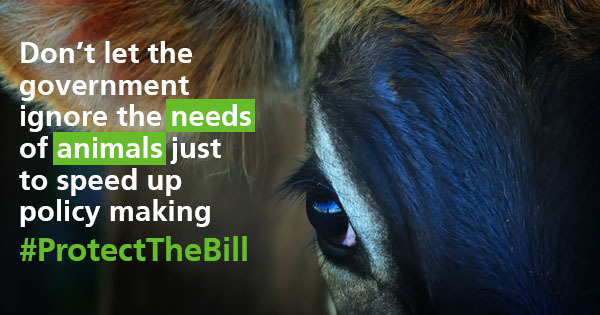 In response to this pressure, the government produced a draft Bill to guarantee that the ability of animals to feel pain and joy can’t be ignored by policy makers when the UK leaves the EU. However, on 1st February 2018, a report was published by the Environment, Food and Rural Affairs Commons Select Committee, which suggests that the commitment to paying regard to animal sentience in the Bill should be delayed. The Committee cites concerns that having to pay regard to animal welfare might lead to a “chilling effect” – slowing down, or freezing, some new policy-making. Compassion feels that the “chilling effect” is entirely desirable. It should not be possible for Ministers to formulate new policy affecting animals without giving full regard to their suffering! Please take a couple of minutes to email Michael Gove, Defra Secretary of State, and urge him to proceed with the full Bill. It is certainly true that parts of the Bill need to be improved. Not least, the wording should require policy makers to pay "full" regard to animal sentience. But the government can make these amendments without dropping the entire Bill. Please encourage the government to respect animals – and respect the voices of people like you. Ask Michael Gove to proceed with the Bill and protect the status of animal sentience in British law. If you live in the UK, please use this form to send this email to Michael Gove, Defra Secretary of State, to proceed with recognising animal sentience in British law. If you live outside the UK, please click here for other actions you can take for farm animals.